Gabby Reece's Açaí Bowl is so tasty and easy-to-make. Volleyball star Gabrielle Reece and her husband, surfer Laird Hamilton, welcomed us at their home in Malibu to do an extreme XPT circuit workout. We followed it up with a post-workout açaí bowl, which was delicious and easy-to-make! Open your superfruit packs with a knife, cutting it across the middle, or use a pair of scissors to cut it across the top. 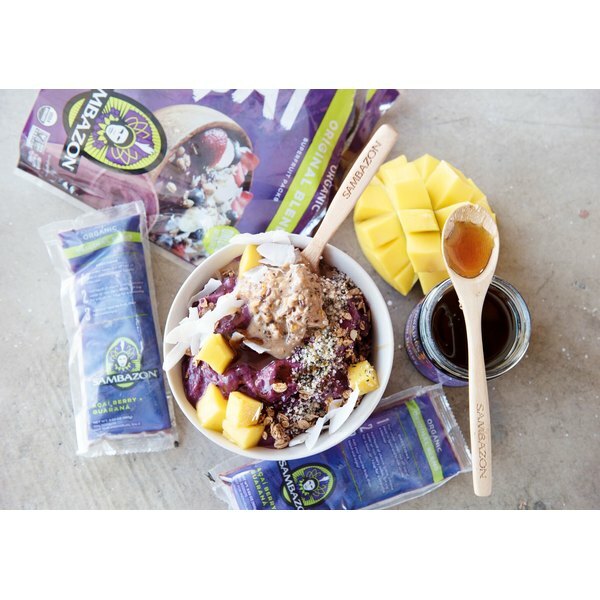 Break açai into your blender, add liquid, cashew butter, frozen mango, banana and hemp seeds. Blend for at least 45 seconds or until everything is fully combined. Pour into a bowl and top with: fresh coconut meat, gluten free granola, raw honey, raw cashews or almonds. If you can’t find fresh coconut meat, try shredded coconut meat. Consider adding raw honey as well, for a sweet kick. Break açai into your blender, add liquid, almond butter and banana (berries, too, if you’re using them). Blend for at least 30 – 45 seconds. Pour into a glass and sprinkle with cacao nibs and hemp seeds. Be sure to use a reusable straw! Have you tried adding açaí to your meals? Is it easy to find where you live? What is your top post-workout meal? Leave us a comment below and let us know!